Predator-prey dynamics are an important evolutionary driver of escalating predation mode and efficiency, and commensurate responses of prey [1, 2, 3]. Among these strategies, camouflage is important for visual concealment, with countershading the most universally observed [4, 5, 6]. Extant terrestrial herbivores free of significant predation pressure, due to large size or isolation, do not exhibit countershading. Modern predator-prey dynamics may not be directly applicable to those of the Mesozoic due to the dominance of very large, visually oriented theropod dinosaurs . Despite thyreophoran dinosaurs’ possessing extensive dermal armor, some of the most extreme examples of anti-predator structures [8, 9], little direct evidence of predation on these and other dinosaur megaherbivores has been documented. 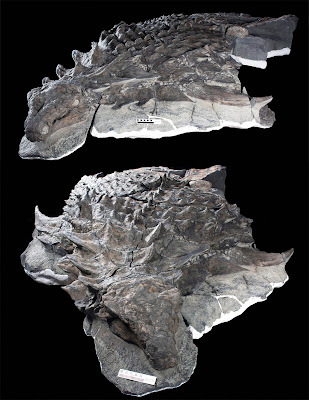 Here we describe a new, exquisitely three-dimensionally preserved nodosaurid ankylosaur, Borealopelta markmitchelli gen. et sp. nov., from the Early Cretaceous of Alberta, which preserves integumentary structures as organic layers, including continuous fields of epidermal scales and intact horn sheaths capping the body armor. We identify melanin in the organic residues through mass spectroscopic analyses and observe lighter pigmentation of the large parascapular spines, consistent with display, and a pattern of countershading across the body. With an estimated body mass exceeding 1,300 kg, B. markmitchelli was much larger than modern terrestrial mammals that either are countershaded or experience significant predation pressure as adults. Presence of countershading suggests predation pressure strong enough to select for concealment in this megaherbivore despite possession of massive dorsal and lateral armor, illustrating a significant dichotomy between Mesozoic predator-prey dynamics and those of modern terrestrial systems.